David “Caesar” Cameron today revealed his intention to desperately assert his role in the centuries old conflict over the future of Europe within the Conservative Party. Caesar laid out his plans for a referendum on whether the Conservative Party should openly rebel against his leadership or simply continue to tear itself apart leading to the eventual end of his career just as it had his predecessors. 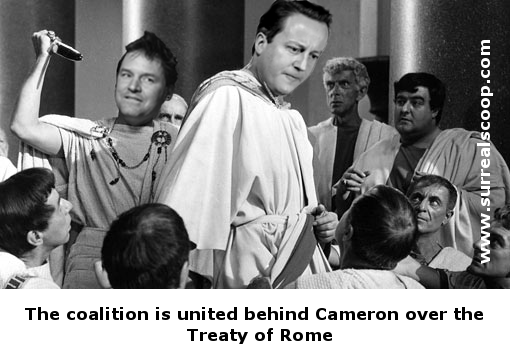 Unfortunately, a party soothsayer lamented that Caesar's fate is sealed in the stars because neither the Tories themselves, nor the other member states, could ever agree on a role for Britain within the EU.